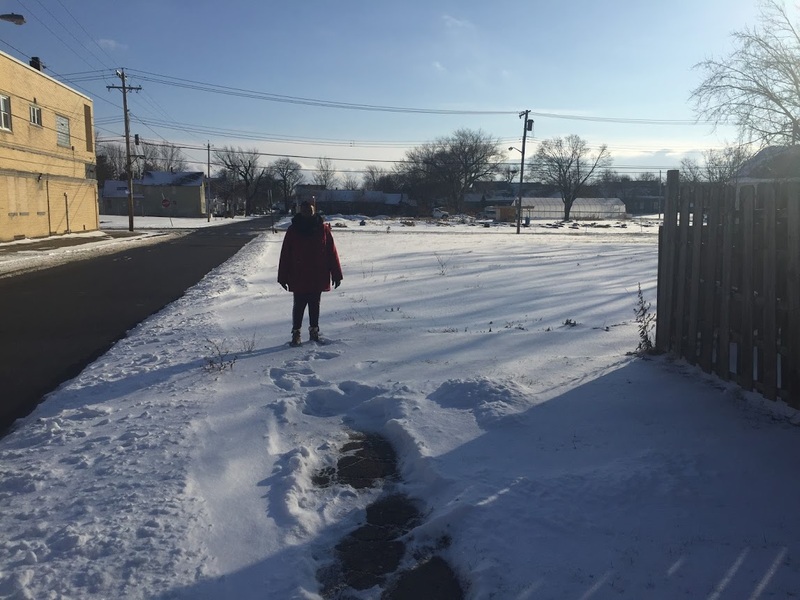 Marva Threat on Detroit Street, where her property line ends and the uncleared, city-owned sidewalk begins. In 2017, a small unit of Buffalo Police assigned to patrol public housing projects throughout the city were responsible for an outsize share of the city’s misdemeanor arrests, traffic tickets, and parking tags. The actions of the Housing Unit, along with its sister squad Strike Force, have caused some East Side residents to feel targeted for punitive fines and penalties. The 21-member Housing Unit, which represents around three percent of the total number of officers in the department—and which polices the three percent of the city’s population who live in public housing—was responsible for 12 percent of the city’s misdemeanor arrests, and at least 42 percent of the city’s total traffic violations last year. According to police data obtained by The Public, the Housing Unit wrote 14,383 traffic violations, nearly 4,000 parking tickets, and 258 city ordinance violation tickets in 2017. The city budgets for 35,000 traffic violations every year. In 2017, BPD logged a total of 5,100 fingerprintable misdemeanor arrests, and the Housing Unit was responsible for 626 of them. But not included in that tally were 3,278 traffic misdemeanor arrests made by the Housing Unit, arrests that are not fingerprinted or tracked by the state’s Division of Criminal Justice Services. While more serious incidents like felony arrests, misdemeanor arrests, and weapons seized decreased by nearly half comparing 2013 to 2017, minor offenses like traffic misdemeanors, violations, ordinance fines, and parking tags increased at least twofold. In 2015, a state law went into effect that allowed municipalities to keep their fine revenue. In 2013, Housing police recovered 47 weapons. In 2017, the figure was down to 27. Buffalo Police are currently under investigation by the state attorney general’s civil rights bureau for an alleged pattern of unconstitutional and discriminatory policing, an investigation prompted by a two-year study by the Cornell and SUNY at Buffalo law schools with a special focus on the BPD’s Strike Force and Housing Units. The study resulted in legal action on behalf of the Buffalo chapter of Black Lives Matter. Last week, BPD interim commissioner Byron Lockwood announced the disbandment of its Strike Force unit, saying that those officers would be reassigned to the department’s Traffic Unit. One of Strike Force’s chief engagements has been the implementation of so-called “traffic safety checkpoints,” interventions that were often joined by the Housing Unit. Strike Force and Housing Unit share office space and command structure; both are overseen by Chief Aaron Young. Housing Unit officers are also often active in other areas of the city, but the lion’s share—roughly 95 percent—of their interventions take place on Buffalo Municipal Housing Authority properties. After plans to disband Strike Force were announced, BPD information officer Captain Jeffrey Rinaldo expressed uncertainty to The Public about the future of checkpoints in Buffalo. “Not sure a decision has been made on the checkpoints,” he wrote in an email. An analysis by The Public last fall showed that the data released by the city demonstrated that minority beighborhoods were disproportionately subjected to checkpoints. The residents of BMHA properties are overwhelmingly minorities. The two officers involved in the shooting death of the unarmed Jose Hernandez Rossy last May, Justin Tedesco and Joseph Acquino, are both assigned to the Housing Unit. A 2016 report by The Public focused on the Housing Unit’s disproportionate arrest rate, as well as its focus on trespassing charges that would often shrivel when brought into the light of a courtroom. One East Side family recently sat down with The Public to discuss how they had been ticketed by police for having snow on sidewalks. Larry Threat said on January 13, he got a ticket an hour after city snow plows buried his sidewalk, which he said is only 30 inches from the street. Written on his ticket was “SF,” for Strike Force. “You gotta give us 24 hours to clear it, okay?” said Threat, who said he has a medical issue which makes him unable to clear the snow. “I made a call to my plow guy, and he came right away.” But still after the timestamp of the ticket he discovered only the next morning. “My problem with this here is, our mayor and the City of Buffalo has to find another source of revenue other than off the backs of poor people in the inner city of Buffalo and I think it is so unfair that they’re out targeting our poor citizens on the East Side of Buffalo,” Threat continued. Threat’s brother and sister-in-law, Michael and Marva Threat, have received two such tickets this winter for their home on Detroit Avenue, one was marked “SF” and one left blank. On either side of their property are vacant, city-owned lots with sidewalks that are never cleared, they told The Public. On a recent visit by The Public, the sidewalks on either end of their home were completely covered with snow. The Threats have previously received tickets from the Strike Force for improper placement of garbage totes and high grass, even as the same city-owned lots neighboring their property go unmowed for most of the warmer months. The special attention authorities have paid the Threats make them feel unwanted in their own neighborhood, even as Marva is the president of her sprawling 14-block block club. “I’ve been down here all my life since 1968, and I feel that my family should not be ran off this side of town through people coming in here and buying up the properties, driving up the rents, and everything else. Why should we be forced to move?” Michael Threat said. Disbanding the Strike Force, interim Commissioner Lockwood said, wasn’t due to criticism, but rather his desire to remold the department to become more community-minded. “Every officer is going to be a community police officer,” he told the Buffalo News. “It’s also central to a badly needed shift from ‘zero tolerance’ and militarized policing to community policing focused on the needs and dignity of residents,” the joint PPG and Open Buffalo statement read.